History : 07/10/97 : Acquired base unit & SmartBASIC datatape for $5.00. 04/03/99 : Acquired Adam/Colecovison combination version of the system still in original box for $99.00. 07/17/00 : Acquired a Buck Rogers Super Game Pack, the book Adam's Companion and the book Coleco Adam User's Handbook for $15.50. 11/08/05 : Acquired another system with external power supply, 57 data packs of software, original manuals and best of all, a 256K ram card and an IDE interface for $122.49. As is so often the case when rescuing a wayward system, this one has come to me missing its documentation and worst of all, its printer/power supply. 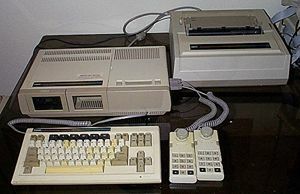 The Adam originally was released with a daisy wheel printer which plugged into the main console and also acted as the power supply for the system. I've since located a stand alone power supply as well as the Adam printer/power supply. I still don't have any doc and I think I've damaged the only data tape I had, the SmartBASIC. If you have anything for the Adam you don't need, I'd be interested in hearing from you. As always, software, doc and other items are in need. Thought the new system was to have docs but it turns out those are missing so I still don't have any Adam docs. I really could use a copy of SmartBASIC as the only data tape I have with SmartBASIC is bad and I can't load it. I'd love to write some software on this system, so if you have a copy or can point me towards an inexpensive replacement please let me know. Now I have lots of software and some doc but what I'm really interested in exploring are the 256K ram card and IDE interface I picked up with this third system. Need to grab an IDE HD and try it out.